Now what?! — Oil + Co. Bust open your diffuser, plug it in and add water to fill line as described in your instruction booklet. Add 2-3 drops of Stress Away oil and 2-3 drops of your Lemon oil. Then grab your new product guide and flip through it as you sit near your beautiful diffuser! It is full of awesome info! Repeat this at bedtime for a relaxing nighttime experience.. we recommend starting with 3-4 drops of Lavender. We like to start diffusing in our rooms at night 20-30mins prior to bed. This allows our rooms to fill with all the oil goodness. We also let our diffusers run until they automatically shutoff once empty. Put your two NingXia Red packets in the fridge. It is best served cold. We will be covering more on NingXia below. You will also want to order a spray bottle for your Thieves Household Cleaner like this one HERE. Fun Fact: The white labeled oils are exactly the same oils as their regular labeled version, just white to simply indicate that they can be ingested, but you can also use them the same way as the other oils! We highly recommend you download our favorite app, Pocket on the Go, from Life Science Publishing! Having a resource tool to reference is vital! CLICK HERE to learn how to download it. There are some steps involved. What: a powerful blend of immune boosting oils! Where: we dilute Thieves 1:4 (1 part Thieves, 4 part carrier oil - it will always show you the ratio on the bottle) and apply to the spine using a roller ball as well as to the bottoms of the feet. Why: to work with the body's natural defense system. Great to use as a daily immune booster! How: apply topically as mentioned above, add a drop or two to warm tea, diffuse like crazy. Studies have shown that Thieves blasts over 95% of airborne germs. What: the swiss army knife of essential oils. Where: anywhere you need extra skin support. We dilute this for little ones following the directions on the bottle and apply it to skin directly wherever we need extra support. Great with coconut oil all over after a day in the sun. Why: to support the skin, for respiratory support, to help with seasonal issues and to relax and calm the body. How: apply topically as mentioned above, diffuse alone to relax or with Lemon and Peppermint for breathing. What: a natural stress reliever and support for discomfort. Where: we love applying on baby jaws and behind our ears for stress relief. It's a gentle and affective support. You can also apply to the throat or any targeted area that needs support. Why: to work with the body's natural defense system. Great to use as a daily booster! ALL the good vibes! How: apply topically as mentioned above, add a drop to warm tea to soothe your throat, or a drop under the tongue to support nervous system. Diffuse to relax and calm the body. We like to mix with Frankincense. What: liquid gold! A versatile oil that works for soothing and calming. Where: we adore Frankincense and like Lavender, it serves many purposes. Great applied to skin to soothe and heal or on to fine lines for anti-aging. Apply directly at the site. Why: Frankincense is a healing oil and can be used for anything that needs support. We also love diffusing it during prayer and meditation for it's grounding properties. How: apply directly or topically with a carrier oil, take internally as a supplement (we love a drop in Ningxia Red!) or diffuse for reflection and to relax. What: a staple citrus oil for cleansing and purifying. Where: we love applying diluted Lemon to our chest and throat, also great paired with Raven. Just make sure not to apply it to skin before heading into the sun. Wait 12 hours after application. You can also apply it to lymph nodes. Why: boost your mood, amazing source of D-Limonene (Google!) for reducing stress and supporting overall wellness. How: apply topically as mentioned above, add a drop to your glass water bottle (must use glass, no plastic), diffuse to combat worry. Remove stickers on glass. Make DIY cleaners. What: to relieve the body of any aches or discomfort. Where: we dilute Panaway with a carrier oil (it will always show you the ratio on the bottle) and apply to sore muscles after the gym or when we need targeted support, apply directly. Why: to support your muscles, growing pains, active bodies, to relax and unwind - we love it used in a massage or on the back of our neck. How: apply topically as mentioned above or add to epsom salts for a comforting bath. What: a powerful blend to support your digestive system. Where: we dilute Digize with a carrier oil (it will always show you the ratio on the bottle) and apply to the belly in a clockwise motion using a roller ball, as well as to the bottoms of the feet. You can add Peppermint to the roller as well. Why: to work with the body's natural digestive system, to help with any tummy troubles. How: apply topically as mentioned above, add a drop to a glass of water. Apply alone to help your body or with Peppermint if the smell overwhelms you. What: apply the roller top and roll on the island vibes! Where: we love rolling on Stress Away when in traffic, after a long day, etc. Apply to the back of the neck or wear as a natural perfume! You can also apply to the outside of your ears. Why: to get away! Transport yourself to an island getaway - even if it's just in the aisle of the grocery store. We love Stress Away!!! How: apply frequently for instant vacation mode, diffuse alone or with lavender to relax, with peppermint to get things done, or with citrus oils like orange, lemon and bergamot for a sunny spa-like environment! What: an energizing and digestion supporting oil. Where: we dilute Peppermint 1:4 (1 part Peppermint, 4 part carrier oil - it will always show you the ratio on the bottle) and apply to the spine using a roller ball, as well as to the bottoms of the feet. Why: to regulate body temperature, to energize your body, to help aid digestion and support an alert mind. How: apply topically as mentioned above, add a drop to protein shakes or your glass of water, diffuse for a lovely morning wake up call. What: a yummy citrus blend with a touch of Spearmint. Where: we love to roll Citrus Fresh on to our wrists and behind ears for a boost of happiness. Again, use caution when applying citrus oils prior to sun exposure. Why: boosts your mood, amazing for reducing stress, purifies the air and helps to combat odors. How: apply topically as mentioned above, add a drop to a glass of water and diffuse to freshen the air. We like to pair it with Lemon or Thieves. What: a powerful blend to support your respiratory system. Where: we dilute Raven (it will always show you the ratio on the bottle) and apply to the chest, as well as to the throat and back. Why: to break up any mucus and to relieve any current congestion. How: apply topically as mentioned above, you can also make a chest rub with a few drops of Lemon and coconut oil or diffuse for a spa-like aroma. Watch this video by Annie on the three ways you can use your oils. We like to buy our roller bottles HERE and pretty ones HERE. You can snag vegetable capsules HERE. We also love using Young Living's V6 carrier oil HERE. You can also snag carrier oil at your local grocery and health food store. Favorites are coconut and grapeseed oil. Make sure to grab organic! Day 1: Diffuse 2-5 drops of Stress Away and rub a drop on your wrists. Try adding a few drops to Epsom salt before sprinkling into your bath for some extra relaxation. Day 2: Add 1-2 drops of Lemon to a large glass of water. Be sure to use a glass or stainless steel container, shake well and enjoy! Lemon helps your body flush out toxins. Day 3: Fill a roller bottle halfway with witch hazel. Add 5 drops Frankincense and 5 drops Lavender. Then add 2 drops Lemon and 2 drops Copaiba. After washing your face and patting dry, shake your roller and apply lightly to your face. You can also add Frankincense to your moisturizer. We love ART Light Moisturizer and Orange Blossom Moisturizer from YL. Day 4: When you wake in the morning, fill your diffuser to the line and add 3 drops of Lemon and 3 drops of Peppermint for the best wake up call! Day 5: Diffuse 3-5 drops Citrus Fresh to purify the air in your home and remove odors. Day 6: Want great oral health? 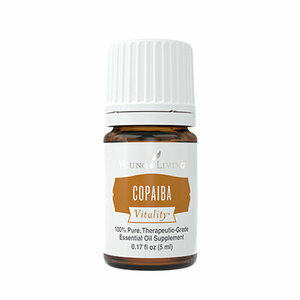 Gargle with 1 drop of Copaiba in warm water. You can also make a fresh breath spray with distilled water and a few drops of Peppermint. Day 7: Have sore muscles following a workout or long day? Mix a few drops of carrier oil with 2 drops of PanAway in the palm of your hand. Apply where needed. Add Copaiba and Peppermint for an extra boost! Day 8: Feeling full or bloated? Apply DiGize and Peppermint diluted to your stomach, or add a drop of DiGize to glass of water or under your tongue for digestive support. Day 9: Get a 16oz glass spray bottle and add your Thieves Household Cleaner packet to it. Top off with water. Spray and clean away! We use it on every surface in our home. Learn more about ways to use Thieves Cleaner and creating a toxin-free home HERE. Day 10: Want an immune boost? Enjoy some Thieves tea by adding 1 drop of Thieves, 2 drops of Lemon and a spoonful of honey to a mug of hot water. Day 11: Respiratory system need support? Want to improve a workout? Apply diluted Raven to your chest to open respiratory channels. Day 12: Need an afternoon pick me up? Enjoy a NingXia Red packet! Read more about the wonderful benefits of Ningxia HERE. Young Living offers a Seed to Seal Promise that no other company does. You can check out all the details HERE. "As the world leader in essential oils, we believe that everyone deserves a life full of abundance and wellness. Our vision is to bring the life-changing benefits of essential oils to every home, family, and lifestyle. Our story started more than 20 years ago with a simple, home-built essential oil distillery. Today, our farms and community span the globe. Because of our proven commitment to providing nature’s best, millions trust us to deliver superior essential oils." Two of the best questions asked are, “How do I use these?” and, “How do I use them safely?” We want you to know that we are here to answer that for you, today and every day! On the bottle itself, on Young Living’s website and in our group, we have guides to using EOs safely. Know that you can pull back the label on the bottle, and look up the oil on YL’s website always for suggested use, to know if dilution is recommended, etc. When storing essential oils, it’s important to keep them in a cool, dark place with lids tightly closed (and always out of reach of children). Always use and store EOs in glass containers, especially when drinking them in water, since most plastic products contain chemicals that can be broken down by the oil. You’ll also want to keep carrier oils (like coconut, olive, vitamin e, sweet almond oil, Young Living's v6, etc.) on hand for dilution. Carrier oils help the essential oil absorb better into the skin and get to where they need to be more effectively. A very small amount of essential oil is enough for each use and mixing with carrier allows you to cover a larger area and last longer, too. You can pre-dilute oils in a convenient roller bottle for fast and easy application. When it comes to children, always dilute to be safe and until you know how they respond. Young Living has a great dilution recommendation chart over on the YL Blog HERE. We have more FAQ covered in our Facebook group! Please never hesitate to ask questions. We're here to help, always. Get yourself signed up for Essential Rewards if you haven't already! Create a wellness plan and embrace the lifestyle. It will bless your health and home so much. Check out the Team Lounge and make sure to stay tuned in our Facebook Group for monthly promos, giveaways and education. Share the benefits you're experiencing with your family and friends and be rewarded through Young Living's generous referral program. When you purchased your kit, you also gained a personal sign-up link for you to share with others as you please. If you need help finding your link, simply ask your Enroller. This is a great way to earn your product for free and more! The YL opportunity has blessed so many families in Oil+Co and we would love to show you the way. We're so thrilled you're with us!